This is a picture of the fictional character Storm from the X-Men as she appeared during her character's iconic "punk" revival. She wears black leather and has large, white mohawk. 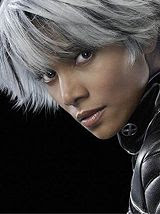 Halle Berry as Storm in X-Men 3 (2006). I wonder if I missed your OSI entry for this wek, you were listed on the linky. Is it also the Manic Mondaay posting? Haale berry's face does look a bit like the illustrator's depictions. Hope you had a goood weekend Mary! 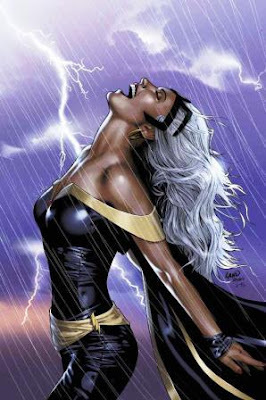 I thought Halle Berry did an excellent job playing Storm in the movies. Great take on the meme this week! Youu are not the person I expected to post pictures of the comic book character but great take on the them, which I am also participating in again. Posted at The Cafe. Sometimes the places you go with Manic Monday just astound me. It always seems to be exciting, new, and adventurous. Nice spin on storm, Mary! I enjoy all cartoons that came alive and became movies. Right now I'm looking forward to the Dark Knight. Have a great Monday! Wow I haven't seen the storm character in a while. Makes me think about reading comics again! Happy MM! This is such an interesting take on the word "storm." Good one! You and Travis are channeling each other today. They called Halle after I turned it down. hahaha! I loved Halle Berry in that role. Had never seen the character with a mohawk, though! I was going to use Storm too. I didn't think of that. That's a great take on Storm. I used to love X-men comics. I never read any of the comics. I did watch some of the animated series. And I thought that the first X-Men movie was a revolution in super hero movies along with the first Spider-Man. Oh, I love Storm! My daughter turned into Rogue last week. You can see her transformation on my blog (Dye, Dye, Dye, My Darling!). Thank you so much for your memes! Such fun.